Pos Free Photo Editor is a free, simple and very user friendly photo editor, that lets you easily view, and enhance your photos. The photo editor supports the major graphic formats and is very intuitive to work with without any "headaches" - It was especially designed for novices as for the short learning curve. It is easy to use multiple image printing tool,that allows you to easily print multiple images on a single page or paper in various way. ...... tool, that allows you to easily print multiple images on a single page or paper in various ways and effects. 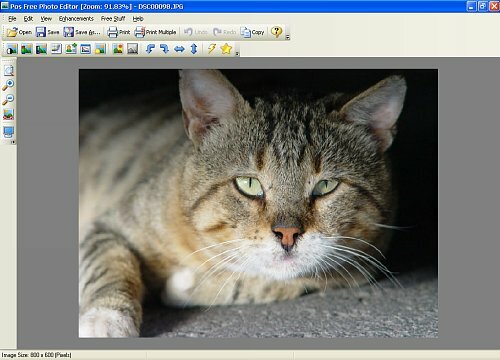 Pos Free Photo Editor also helps you saving on expensive paper. Qweas is providing links to Pos Free Photo Editor 1.41 as a courtesy, and makes no representations regarding Pos Free Photo Editor or any other applications or any information related thereto. Any questions, complaints or claims regarding this application Pos Free Photo Editor 1.41 must be directed to the appropriate software vendor. You may click the publisher link of Pos Free Photo Editor on the top of this page to get more details about the vendor.